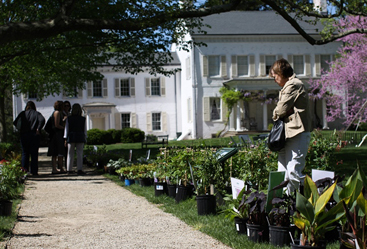 MORVEN IN MAY: As part of its annual celebration of art, craft, and garden, Morven Museum will hold its Heirloom Plant Sale this weekend alongside its arts and crafts show. Morven in May is the place to find those plants uncommon in modern nurseries: traditional flowers, peonies, and scented annuals and vines. Besides plants, of course, there will be all sorts of artful delights for visits under the big tents on the lawn where 25 professional artists and artisans will offer their original pieces for sale. For tickets to the preview on Friday evening and more information, call (609) 924-8144, or visit: www.morven.org. Artists and crafters often feel impelled to create. Barry Newstat is a case in point. From early childhood he has been losing himself in the art of making things. “I can’t not make things,” said the now accomplished furniture maker and woodworker who will be bringing six of his pieces from the Chicago suburb of Western Springs to Princeton this weekend for the annual celebration of art, craft, and garden that is Morven in May. After hearing about “Morven in May: A Celebration of Art, Craft and Garden” from Morven Director of Development Barbara Webb last year when she visited his booth at the Philadelphia Art Museum Craft Show, Mr. Newstat jumped at the chance to participate in what he described as a small, high quality, boutique show. Mr. Newstat won the Wharton Eshrick Prize for Best of Show in woodworking in Philadelphia and is one of 25 professional fine craft artists from around the country selected to take part in Morven’s juried show; and one of several participating for the first time. In past years the show was by invitation only but this year the organizers used Juried Art Services (www.juriedartservices.com), the online service employed by the Smithsonian Craft Show and the American Craft Council to help whittle down potential participants from the 115 who applied. James C. Steward, director of the Princeton University Art Museum; art auctioneer David Rago, and Veronica C. Roberts, curator of Modern and Contemporary Art at the Blanton Art Museum at the University of Texas were the jurors. The first time Barry Newstat worked with wood, making a bowl from Honduras mahogany on a lathe in junior high, “it was a joyful experience.” Seeing his son’s excitement, the boy’s father bought him a lathe and together they began buying small pieces of wood from around the world. “In a way, Barry Newstat Furniture began back then when I was 12,” said the artist who began his furniture business in 1987. Using unique lumber and traditional joinery, he crafts chairs, table that have become more abstract over the years. Recently he’s introduced “live” edges to his work. But always, he is guided by three principles. Each piece must be sculptural, decorative, and functional. The six items he will have at Morven are two cabinets, two side tables, and two small round tables. One of the cabinets is his newest piece. Also displayed at the recent Smithsonian Craft Show, it can be viewed on his website: www.barrynewstatfurniture.com. Besides Mr. Newstat, those participating for the first time are basket maker Kari Lonning from Ridgefield, Connecticut; the Cylinders from Oley, Pennsylvania; and Ms. Falls from Hartland, Vermont. Ms. Lonning’s work is in several museum collections and can be viewed on her website: www.karilonning.com. The Cylinders, who have been working together for 26 years, will be bringing their biggest piece to the event. Titled Unfolding Moment, it’s a huge Cubist-style necklace that took them four months to make and uses all sorts of materials including resurfaced saxophone keys. The couple fashion unique pieces from simple brooches and rings to show-stopping creations that take months to complete. They incorporate found objects reclaimed from musical instruments with inspiration from Lalique, Spratling/Los Castillo, Jensen and Ken Cory, and other hand-craftsmen. According to their website (www.lisaandscottcylinder.com), “they take a no-holds-barred attitude about materials and techniques.” Their work is sure to elicit a smile. Also a first time participant, Deborah Falls was drawn to the show by the feeling that the preponderance of botanicals in her paintings would be a good fit. The artist, who has experience in textile design, paints with colored dyes on hand-woven Indian Dupioni silk. Self-taught in this medium, she is inspired by her own garden. For her flower-inspired work, Ms. Falls uses fiber reactive dyes that are imported from a small company in France and specially formulated for silk. “Rather than paint on the surface of the fabric, the color becomes part of the fiber with which it chemically bonds,” she explained. The work of these professional artists and artisans will be on display alongside masterful pieces in glass, ceramics, mixed media, and decorative and wearable fiber. All will be offered for sale in gallery-style booths under an enormous tent on the Museum’s great lawn. Friends of Morven can preview the sale (and get a 10 percent discount on purchases) on Friday, May 2, from 1 to 3:30 p.m. Public hours are Saturday May 3, 10 a.m. to 5 p.m., and Sunday, May 4, 11 a.m. to 4 p.m.
“Morven in May: A Celebration of Art, Craft and Garden,” begins Friday May 2 with a Preview Garden Party, from 6:30 to 9 p.m.; tickets, which must be purchased in advance, are available on Morven’s website or by calling (609) 924-8144 ext.113. Tickets range from $125. The show then opens to the general public on Saturday from 10 a.m. to 5 p.m., and Sunday 11 a.m. to 4 p.m. Tickets for the Saturday and Sunday Art Tent are available at the door and are $10 per person, $8 for Friends of Morven. All proceeds help fund the museum’s collections and exhibitions, historic gardens, and educational programs. Morven Museum & Garden is at 55 Stockton Street. For more information, call (609) 924-8144, or visit: www.morven.org.